Scarlet Heroes is a stand-alone game, but it’s also intended to be capable of functioning as an overlay on top of your own favorite OSR game. Given that purpose, it’s got to have classes that can map neatly to the OSR standards. Scarlet Heroes offers four classes- the classic Fighter, Cleric, Magic-User, and Thief. Each class starts with a fixed number of hit points- 8 for Fighters, 6 for Clerics, and 4 for Magic-Users and Thieves, gaining half that many for each further level, all of these numbers modified by Constitution modifiers as is customary. Each class has its own attack bonus progression, with Fighters fastest, Clerics and Thieves about half as fast, and Magic-Users less than a third as rapid. Class weapon restrictions do not exist as such; instead, classes other than Fighters are capped in how large the damage die of their weapon can be. Clerics, for example, are capped at 1d6; even if they pick up a greatsword, they’re still not going to be able to roll more than 1d6 for the damage die. Fighters have no cap, Thieves are capped at 1d8, and Magic-Users are limited to 1d4. By the same token, there’s no hard bar against armor for any class, though Magic-Users can’t cast spells while armored and Thieves can’t use their special archetype trait for movement or stealth checks while wearing anything heavier than leather. The classes are designed to be thematically loose, the better to provide quick mechanical representation for a wide range of concepts. The Thief class, for example, is intended to cover all “skill heroes”, who rely on a particular set of non-magical skills to make their mark. A paladin could be represented by a Fighter or by a Cleric depending on the nature of their focus- or the hero could just multiclass, taking a dash of clerical abilities to complement his pious hewing. Of course, GMs don’t necessarily have to adapt other classes into Scarlet Heroes. 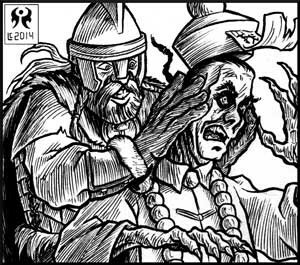 Classes from other OSR games can actually be dropped directly into the system with only trivial changes. Their existing THAC0 can be used to determine their attack bonus, and they can keep their hit points, descending armor class, and class abilities without change. The only real addition necessary is to give them a Fray die, an automatic damage die they can roll against inferior foes each round. Most classes would simply get a d6 Fray die, while Fighter-type classes would smite with a mighty d8, and Magic-User types blast with a d4 that can affect even powerful enemies. Of course, these are just the high points of character creation. If you’d like a more detailed, look, here’s the full 12-page character generation chapter in its current pre-proof state. As you can surmise, the book is very close to completion. I’ve been deeply impressed with the speed and reliability of my artists, as they’ve already managed to finish 2/3rds of the book’s art before I’ve even started the Kickstarter. There’s a distinct chance that their lightning-fast pens will have the art done for this book before the campaign ends at the end of February. I’m eager to see what they can do.